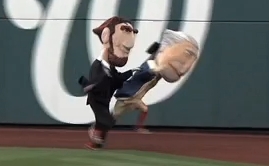 Video: Abe Lincoln shoves his way to presidents race victory | Let Teddy Win! Abraham Lincoln returned to form Sunday at Nationals Park — cheating form, that is. In a race more fitting for a roller derby, “Honest” Abe took out George Washington with an anabashed body check along the outfield wall, clearing a path to victory after Thomas Jefferson had taken out Teddy Roosevelt in similar fashion. As has become the custom, corrupt race judge Screech turned a cheek and failed to disqualify Lincoln.